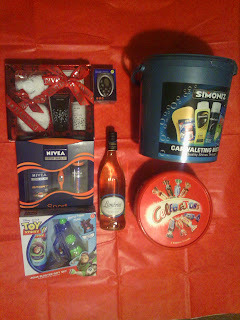 Tesco have kindly given me a a family treats bundle (1x mens Nivea gift set, 1x womens Bayliss & Harding gift set, 1x kids Toy Story bath set, 1x bottle of Lambrini, 1x tub of Celebrations chocolates, 1x portable sports radio and 1x Simoniz car valeting bucket) to give to one very lucky winner. Why not check out their website at http://www.tesco.com. You can become a fan on Facebook at https://www.facebook.com/tesco, follow them on Twitter https://twitter.com/#!/uktescooffers and follow them on Pinterest http://pinterest.com/tesco/. Entry is via the Rafflecopter form below. The competition will be running from 12.30pm on 1st October 2012 until 4am on 31st October 2012. It is open to UK residents only, aged 18 years and over (you will be required to declare your date of birth in order to claim your prize). Winners will be drawn at random on 1st November 2012 from all valid entries. no matter where you are there is always a tesco open close by, very handy! that they sell such a wide range of products so i can go there rather than lots of different shops (so much easier with 2 kids in tow)! The space in my local Tesco. It's one of their biggest stores. Saving my clubcard points for treats. They sell everything I need in one shop. I love tesco because they have the most generous reward system with their clubcard! I love the fantastic bargains I can get there. Our local Tesco is in a good location, plenty of car parking available. To be fair, locally, it's the only supermarket that I can do a 'proper' shop at - in that I don't have to go elsewhere to get the more obscure items. But the main thing is the Clubcard points, which soon rack up, and I use them for family days out, which is handy as a mum of 4! They have good overall prices rather than just special offers. I love when I am not there any more. But still, I have to go every day or so. They are open 24 hours! I love that the Tesco near me (Sevenoaks) is massive and has eveything, so if I need food I go there and then if a need a gift I go there too! I have them deliver weekly and my Wife loves their own brands! Points and Reward Vouchers for things you buy! The fact there's a Tesco Express near to me! I love the Christmas savers club. I save my clubcard points all year and get a nice some back in November. I use £100 to double up on kids toys so that gives me £200 to spend on toys! Thats £100 FREE!! Now who else does that? and have a few hundred left over for food and other things. We don't have a big tesco in our town, so when I go to Tesco its to fill a trolley full and stock the cupboards with all the things that are on offer so its always a good buy. Also I love when they send me discount codes that more than cover the delivery charge and then it is worth me getting it all delivered and saving me the journey! The delivery man is lovely and they hardly ever get any of the orders wrong! They are within walking distance of where I live. I love that they open another check out if there is a queue & collecting the points so I can get myself & the family a treat. I liked that they sell such a variety of items, and that their prices are pretty good. The selection of products, from food to electrical goods to clothes. I like the kids clothes and offers on food. They have such a wide selection of goods it saves you traveling to several different shops. I love the clubcard, but also that no matter where you live there is always a Tesco near by for you. And their own brand vodka is a really good price! I love that I can buy clothes and groceries from the same place! The staff in my local Tesco are brilliant, very polite and helpful, the prices are great and the clubcard points are useful. I love the club card points. I love their entertainment section as they have a vast range at very competitive prices. I like that it only takes me 2 mins to get to my local store and that it sells an enormous range of products. I like the variety they have and being able to buy so much under one roof. Their prices AND that their stores are the cleanest of all the major supermarket brands. I posted a massive rant about this on Facebook a few months back. I won't go to any other store. i love the fact they sell cheap designer perfumes! I love that I can do my shopping and buy any cards & presents too. That I can get anything and everything in the same place, for a good price! Is it awful to say the free wifi? This year i've had to spend a lot of time looking after my Mum, sho has no internet and I can't get a decent phone signal there. So escaping to the local Tesco Café with my Ipad and a cup of tea gave me a wonderful break! I love that you can get almost everything you want (from food to clothes to toys) all in one place! I love that they are still doing bogofs when other shops aren't. And the clothes. I love Clubcard rewards, I saved up enough last year to treat myself to a lovely expensive watch, just for doing my shopping where I would buy it from anyway! The clothes are good value. I love the fact that Tesco is great value for money in all their foods, clothes and other goods that they sell, plus yo9u get rewarded for using them. I love our local Tesco as it's the only store in my area where I can park up the pram securly whilst doing a big shop with the trolley. It makes life so much easier when you're on your own with the little one and there's no rush at the check-out to pack the items under the pram when we're finished. Tesco Clubcard! I traded in my points for Airmiles and it bought hubby and I flights to St Lucia last year - fantastic!! I love the fact I could wander around my local tescos for hours! I lose track of time browsing in the clothes, electrics, gifts, food and then have to have a coffee in the cafe. I love the affordable prices and the huge selection of items available in your store. I love that I can do all my shopping in one place and after my shopping I can get a cuppa and breakfast in your cafe. The clothes and footwear are fantastic value for money. There is a cafe there that sells Costa Coffee is a extra bonus ! I love the Tesco rewards, especially when they are doing double ups! That it's within walking distance of my house! The Club card points and reward scheme. The great selection of products. I have a Tesco store less than a mile away from homw which is open 24 hours a day. I know that I can get anything I need at anytime from there -useful when you have a sick child and drop and smash the Calpol bottle on the kitchen floor at 3am!As I am a regular in the store I know lots of the staff so there's always someone to say hello to. They have a good range of products , reasonable prices and I love collecting Clubcard points.Since the scheme started we've managed to gain enough points( by shopping at Tesco, having a credit card from them and buying petrol from there) to have a family caravan holiday or Butlins break each year. Club card points! And they do a cracking Christmas in July! tesco has all my needs covered - their finest range is amazing and well worth a few pennies more - their seasonal range of products is fantastic too! I like the Delivery Saver scheme, makes it a lot more affordable to get groceries delivered. I can buy all I need under one roof. Low prices and clubcard points. I like the cheap offers and reduced items! What I love most about Tesco, is they have everything you need under one roof. I too love the clubcard points, we have had some great treats from them. I try and save them for days out. This year I got merlin passes with them which have been brilliant! I love that when you order groceries online, the delivery drivers are always really lovely! I love that they have a store in the next town open 24 hours, petrol is often cheaper and they have some good deals on non food items.